If you think the Wikipad is a brave concept, you're not alone, but the company remains confident that tablet gamers still want the joystick experience. The Wikipad was launched in the US in June and begins shipping to UK retailers next week, ahead of an anticipated September release. 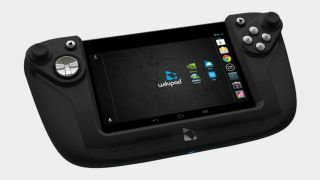 Wikipad's managing director Fraser Townley told TechRadar, "We went with the Pinball Wizard approach," when it came to designing the gamepad add-on. "Just shut your eyes," was his message to gamers who might not be 100% behind the peripheral's large look. Obviously having your eyes closed is just setting yourself an unnecessary challenge when it comes to playing games, but the message was clear - this is all about the feel. When asked whether the Wikipad was swimming against a tide of evolving touchscreen gaming, he told us that the company believes that the games found at the top of the app charts are still made for joysticks. "They're all controller games," he said. While we'd say that Angry Birds is pretty much tailored for touch, the big first person shooters and more demanding 3D games such as Grand Theft Auto are becoming increasingly frequent on mobile devices, and Wikipad is jumping on an opportunity to keep classic gamers happy. The company also told us that it's already planning annual cycles of the tablet, and that while the current version ships with Android 4.1, it will be upgradable to 4.2 down the line. The tablet can not only access apps on the Google Play store but PlayStation Mobile games and TegraZone titles. The tablet comes with a 7-inch screen, Tegra 3 quad-core mobile processor, 1GB of RAM and 16GB of storage, which can be bumped up to 32GB. As for how sales have gone so far, Wikipad told us that the numbers met expectations. "We've sold what we wanted to sell," it said, adding that a large number of UK retailers were already on board. How will it fare this side of the pond? It may just be a month until we begin to find out.